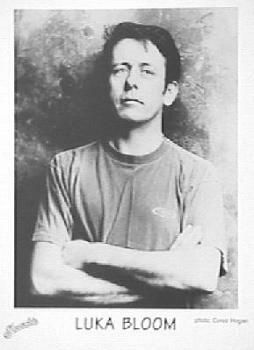 Luka Bloom: "EI104. the lovely old jumbo that brought me to America in 1987. Window seat: looking down from 35,000 feet at America, repeating quietly to myself, 'Hi, my name is Luka Bloom. I'd like to play here.' Getting used to the sound of my new name. A week or so later I'm in this college club called Dylans in Georgetown, Washington DC, meeting the owner and saying precisely that. For the next few months I was in Dylan's every Monday night. Singing my songs, getting used to being Luka Bloom; singing my heart out to people that had no idea that for the previous 11 years I had struggled at home, recorded three albums, and to be honest, failed to make any inroads into the world of Irish music. As my mother used to say 'necessity is the mother of invention'. Riverside was released in January 1990 and the fun began. Touring America and Canada in a Winnebago, playing everywhere that seemed to have electricity. As well as my own tours, I played with The Violent Femmes and with The Cowboy Junkies in Europe. At this time I began to work in Europe, especially Holland, Belgium, Switzerland and Germany. In mid 1991 I cycled on stage at Pinkpop in Holland during a show which included Lenny Krawitz, the Happy Mondays, Joe Jackson. One I did, Torhout/Werchter in Belgium with Bryan Adams, Red Hot Chilli Peppers, Lou Reed and Crowded House. Interesting times. The video from Riverside was Rescue Mission, which rightly won an award for the amazing Paula Walker, who directed it. 1992 delivered my second CD, The Acoustic Motorbike, from which L.L. Cool J's "I Need Love" charted in some countries and opened many doors for my own songs. Then Australia happened. Happy days. So far I've enjoyed three Australian tours, great shows, endless fun, and even a little sunburn. However, 1992 was overshadowed by the passing of my mother in September. I toured Australia immediately after her death, but knew it was time for a break. February 1993, I'm sitting in my home in Dublin, not particularly wanting to go anywhere or do anything. The phone rings, as it will do. It's Alan Pepper from the Bottom Line in New York. In celebration of the clubs birthday they've invited Lou Reed to do a songwriters night with three other singers. Lou agrees, and suggests David Byrne, Roseanne Cash and Luka Bloom. This was a very special evening which gave me that proverbial shot in the arm. Thank you Lou! Turf was my third and final Reprise album. Suitable pensive and introspective, it was a fitting end of the Living in America phase of my life. I'd already decided to come home to Ireland and dip my toes back in the water here. Writing songs, doing some shows, walking the Burren, basically preparing for something which seems to be a feature of my life, beginnings. I spent much time of 1995 in Birr, Co. Offaly, in a little cottage among the trees between the rivers Camcor and Brosna. Here in the belly of Ireland, I wrote the songs which fill the CD we now know as Salty Heaven. Just as "I Need Love" could only have emerged from my time in New York, these songs could only have come from this landscape I call my home. Home being many places to be a dreamer. Dreaming and writing the songs is the easy bit. Taking the songs out and sending them on their way is where it gets tricky. It involves trust, and letting go of lots of things. You need good people to be able to do that. That is why I love this album so much, and am proud to deliver it. Because such good people have come together and put flesh on the dreams. From writing the songs in Birr and Ballyvaughan to recording in Eoin O'Toole's mill in Naas, County Kildare with Paul Barrett, to further recording with Peter Van Hooke and Rod Argent in England, to mixing it in Abbey Road, the whole process was like a slow-floating river, determined to take its own course, following nobody's timetable. It seemed to take forever and probably did. Who knows, maybe the result is suitable timeless."